The Deni ice cream maker is fully automatic; all you need to do is prepare your batter and let the machine take care of the rest. In less than a half hour you can be enjoying delicious homemade ice cream. The machine can churn up to 1-1/2 quarts of ice cream at a time. You don't need to worry about the mess of salt and ice cubes. After only 8 hours in the freezer your freeze bowl is ready to go. Place the bowl on the base, insert the paddle and lid, turn on the machine and slowly pour in your batter. Before you know it, your ice cream is blended into a smooth, frozen confection. The powerful 40 watt motor, double insulated gel cylinder and transparent lid take all the guess work out of making homemade ice cream. A built in candy crusher makes it simple to add additional ingredients. With the built in cord storage, you don't need to worry about yet another cord dangling when not in use. This unit also comes in several colors, so you can match it to your kitchen décor. The Deni ice cream maker is simple to use as long as you follow the instructions. The ice cream turns out very creamy and delicious. Having the ability to make ice cream with fresh ingredients, without all the preservatives and such, is a nice luxury to have. The customer service seems to be on the ball. When customers have called them with issues, they are quick to resolve the problem and send out replacement parts if necessary. The price is reasonable and the appliance is small enough to store easily. Once you know the steps for making ice cream with this little machine, you can teach your kids because this machine is that easy to use. The Deni ice cream maker has a built in candy crusher. It looks flimsy. It looks like it may break apart whenever you put any kind of hard candies in there for crushing. If you stop the machine in the middle of churning for any reason, it will not restart. The churning must finish completely. Some customers have had issues where the motor stops before the ice cream is done. This makes the ice cream inconsistent with frozen outer portions and runny in the center of the bowl. The Deni ice cream maker overall seems to be a fairly good buy. The price is low and it performs well for the most part. The company seems to stand behind its product. If you don't have a big budget, this ice cream maker may be worth a try. It is a bit noisy, but most ice cream makers are. If you have a small family, this machine may be adequate for your needs. Most of the customers have great results and get delicious, creamy ice cream to enjoy in less than a half hour. At the time of writing this review Amazon Had this ice cream maker 50% off list price and ships free with super saver. 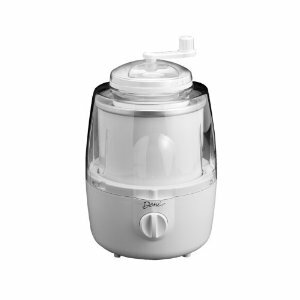 Read more consumer reviews on these Deni Ice Cream Makers at Amazon.